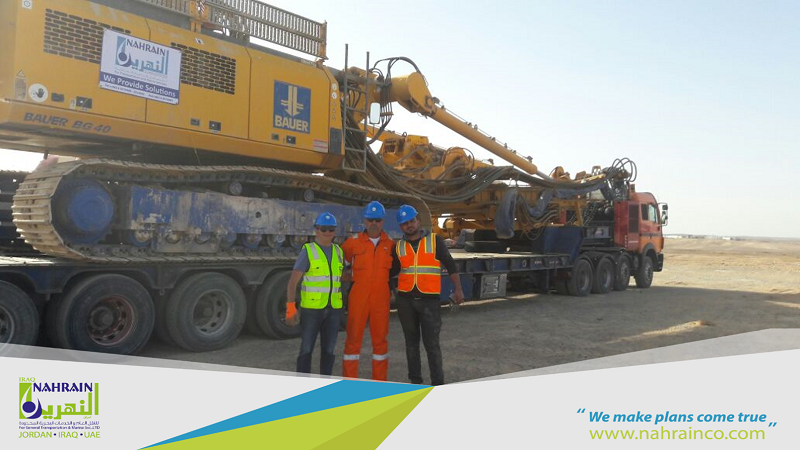 Al Nahrain have recently moved a Caterpillar excavator (CAT385C) rig with all accessories including a mono boom & counterweight. The main part of the excavator weighed 114tns and the full accessories had a total weight of 115tns and involved several parts with lengths up to 24m. “Loading the cargo at the Swaqa site. Upon the trucks arrival to the site, our working team was ready with all required equipment. Complying with all safety instructions, the load was secured by applying special lashing ratchet and cam buckles, fixing the fitted dunnage and using appropriate load binder chains and standard slings etc. Moving the loaded trucks from the Swaqa Site to Z.F.Z. escorted by our patrols, front and rear. All trucks safely arrived and entered Z.F.Z. to start the customs formalities. The whole 9 truck shipment was delivered safe and sound, always fully escorted, to the complete satisfaction of Al Nahrain’s client.